A cat is a Cat and all boxes are fair game! And that's one bit cat. It's good to know that any cat likes a box. now I've seen everything? Did not realize that no matter what size the cat is- they love boxes! Chees and have a fabuloso day! What a cool snap. If it's cubed and of card, kitty will have a right ruddy go at squishing in! Cute! If it fits, he sits. And it probably doesn't matter what else is inside either. Lucky Lady,Yes this one big kitty.sorry that you are having a problem. 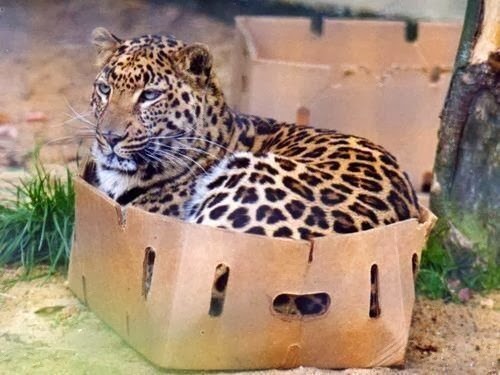 Susanne Lucas,indeed it fits so it does indeed sits. Our cats seem to love boxes. Every time that we have one, all the cats crawl into the box. So funny to see them. Syd something about boxes that makes them feel safe I guess.